By Grace Alone: Not Me! 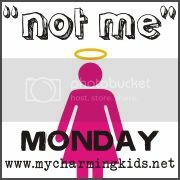 Last Monday I woke up thinking it strange that I did not have even one Not Me! to blog about. What a perfectly well-behaved week, or so I thought. What followed the rest of the day proved to be quite a Not Me! Monday after all. I started by calling the OB clinic because the anti-nausea prescription they gave me on Thursday had given me a migraine by Friday. After not having taken it all weekend I was right back to constant nausea and vomiting. I thought surely they could just call in a new prescription for something else. Really, it seemed simple enough. After a brief conversation with the crabbiest, rudest OB nurse I had ever had the displeasure of speaking with, I was on my way to the clinic for an appointment. - I was not muttering under my breath the whole way about the crabby nurse, or the stupid appointment which was sure to result in another $22 copay. -I was not disgusted by the idiots in the always-overfull parking ramp who park crooked and take up two parking spaces. -I was not annoyed that I had to park all the way on the top level while it was snowing to go to the appointment, all the while cursing HP and the crabby nurse who was making me come in. -I stopped down at the lab first for a UA, as told to do by the aforementioned nurse and was as polite as could be not rude to the person at check in who had no idea why I was there. Apparently Nurse Crabby forgot to tell them I was coming. -I was not completely fed up by the time a reached the OB clinic. -Fortunately, I was pleasantly surprised to learn there was no copy. -It was not me who started to fell slightly guilty about being so mad when a very kind nurse discovered I had lost another 2 lbs over the weekend. -I was not eating my angry words when the Dr came in with the results from the UA which showed I was dehydrated and had protein in my urine. -I did not feel even the slightest bit silly for being so upset about having to see the Dr as they set me up for IV fluids that I was in great need of. -I was not feeling guilty for cursing HP when Nurse Friendly brought me extra blankets and a heating pad. -The guilt did not immediately dissolve back into irritation when Nurse Friendly couldn't find a vein for the IV and had to get Nurse Crabby to help. -The part where Nurse Crabby blew up one of my veins, leaving an ugly black and blue mark on my hand, didn't bother me at all. Nope, I was perfectly calm. And I did not feel the least bit bad when she was very kind and apologetic about it. Nope, I didn't need to feel bad since I was not upset! -I did not end up having a wonderful nice nap under the extra warm blanket that Nurse-not-quite-so-crabby-as-I-first-thought brought me. -I did not end up feeling even worse about my own crabbiness when Nurse Crabby-now-Nurse Friendly II stopped in all afternoon being very kind and compassionate. All in all, I felt much better after the afternoon on the IV and I left HP glad that was my clinic and even appreciating both nurses. At least up until the part where I got to my car that was buried in snow! wow! what a day for you!! I've had those crabby nurses and it's not fun. they really are usually nicer in person and I always wonder what they are going through to make them that crabby! glad you got the fluids you needed and a nap! What a day and what a roller coaster! That nap sounded nice. :) I'm not a fan of people who are crabby for doing their job. Glad your day had a good ending! I am a nurse and I love it. Your post is well written - hope you are feeling better. What a day you had. Excellent post. Blessings. Oh, I've had my veins blown up way too many times... esp. when going into delivery, or with the Glucose Tests (for 4 babies), that I failed each time, the 1st round of the Glucose Test, anyway. Gosh, sounds terrible! I'm always sooo nice to the nurses, literally kiss their tushies... and I just expect them to be nice back. Not all of them, right? Feel better! Sooo happy to have found your site!